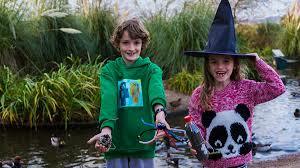 Spooktacular ‘wild’ goings-on at UK WWT Wetland Centres this October Half Term! Children and their families can enjoy a scarily huge variety of spooky fun at nine WWT Wetland Centres spread across the UK this October half term. Many events incorporate a ‘wild’ element, giving a different twist to traditional Halloween fare. Activities include discovering the gross side of nature at the Yuck Show at WWT Arundel (W. Sussex), the Nauseating Nature Trail at WWT Washington (Tyne and Wear) and Broomstick flight training following the winter journey of the whooper swan at WWT Martin Mere (Lancashire). As well as Halloween events, some centres are also playing host to iconic children’s toys over October half term with the GIANT LEGO® brick animal trail at WWT Llanelli (South Wales), GIANT Wetland Top Trumps at WWT Slimbridge (Gloucestershire) and Guess Who? at WWT London. « Explore the world of magic and delve into Harry Potter’s wizarding realm with Harry Potter: A History of Magic at the British Library!